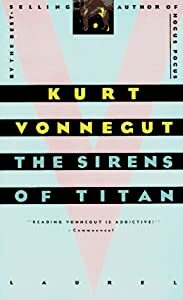 The Sirens of Titan is Kurt Vonnegut‘s first foray into young-adult fiction — perhaps a genre he should have spent more time with, considering the success of this book. His skill at characterization is in full-force, particularly this time considering the non-humanness of his protagonist. The Sirens of Titan is about the adventures of Jimmy, the giant space dog. Jimmy loves living in space, particularly since he doesn’t have to worry about breathing or, luckily, eating, given that there’s not a whole lot of stuff in space TO eat. But all Jimmy wants, ultimately is a friend. Even with occasional run-ins with aliens, space is pretty lonely. Poor puppy! Even though he’s alone, he has some pretty good times playing. You can do a lot when you’re weightless, and the first third of the book is taken up with the events a dog can get up to alone in the middle of space, hovering around Saturn and its moons. But Jimmy gets a little bored, and decides to go out exploring. Given the size of Saturn and the pretty large amount of space its moons take up, Jimmy hasn’t seen a whole lot of his own back yard. Soon, he finds what turns out to be Jimmy’s favorite moon, Janus; though a small moon, it’s just about the perfect size for a giant space dog. But Jimmy realizes there are other moons out there for him to explore as well, so he keeps on searching. After a while, Jimmy finds Titan (which, admittedly isn’t that hard to find, being Saturn’s biggest), and he’s surprised to discover that there’re creatures there. Jimmy goes over to try to make friends with them — and for a while all is well. The beings are beautiful birdlike women with magnificent voices. Jimmy’s happy to play with them, but it soon turns out that all’s not well. They’re responsible for luring other space travelers to their deaths to crash below on the surface of Titan. After watching one traveler crash, Jimmy gets upset and makes plans to save others. It does take a while for things to make it out to Titan, so he’s got a while to hone his plan. When a traveler DOES finally make an appearance and the Sirens start singing, Jimmy lets out a colossal, deep-voiced bark and growl, which scatters the sirens. In the time this takes to play out, the traveler gets close enough to see that Jimmy saved his life, and the two become fast friends. Vonnegut is to be commended for introducing kids to Greek and Roman mythology in a stealth way — when readers later discover the myths of the Sirens or pick up Homer, they’ll be pleasantly surprised. This, and the great writing you expect from Vonnegut, makes up for any flaws of the novel — most notably the existence of sound in space. Vonnegut doesn’t address that at all, and how the Siren song can be heard, let alone Jimmy’s life-saving bark. I typically believe that it works best when fiction, particularly YA fiction, is accurate as possible, it’s definitely not a dealbreaker for me. I would wager that there are very few giant dogs around Saturn, after all. Perhaps the best part of the novel is that Jimmy is never described as a particular breed, allowing readers to imagine their own pet dogs in his stead — hopefully leading to wonderful, imagined futher adventures between Jimmy and his unnamed companion. Vonnegut knew what children needed in fiction, and I wish he’d explored that avenue more.